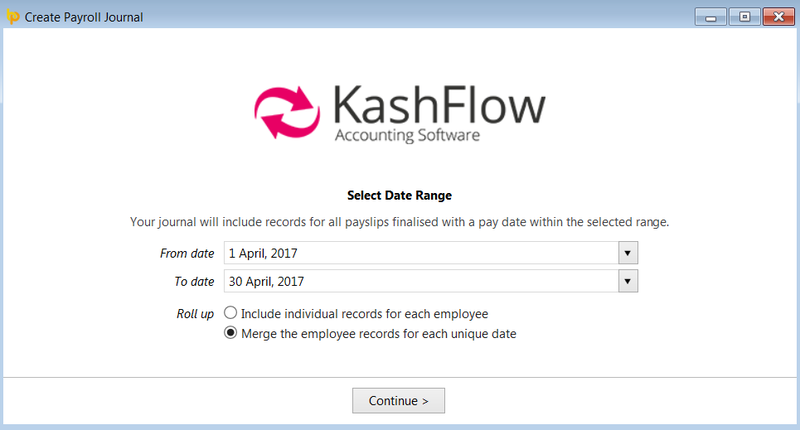 BrightPay's payroll journal feature allows users to create wages journals from the finalised payslips and export to CSV for upload into Kashflow accounting software. 2a) On the next screen, set your Date Range - the journal will include records for all payslips (across all pay frequencies) with a pay date within the selected range. b) Roll up - select whether you would like the journal to include individual records for each employee or whether to merge the records for each unique date. 3a) Nominal Ledger Mapping - the default nominal ledger code mappings which specifically relate to Kashflow will already be entered for the user. If desired, these can be edited, should the user wish to map to different nominal accounts that exist within Kashflow. A nominal account code can be used for multiple items. b) When ready to proceed, click 'Continue'. 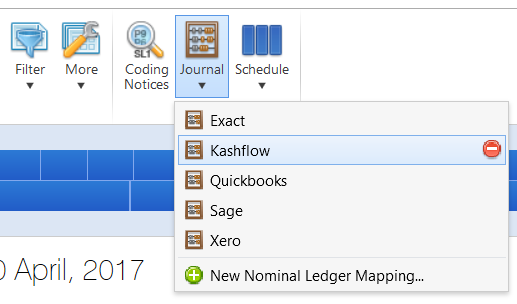 4) Nominal Ledger Mapping (Director Items) - this screen allows you to map directors' pay items to alternate nominal accounts within the Kashflow software. 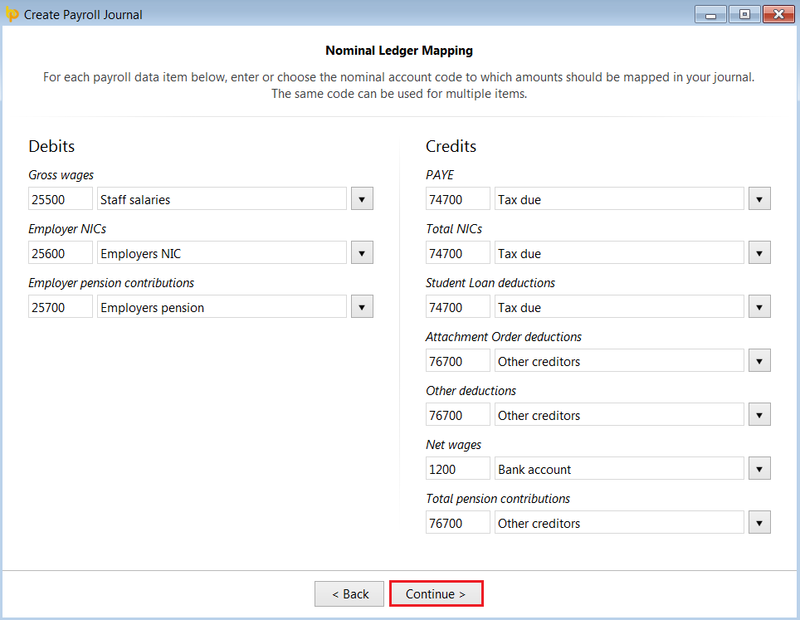 a) Should you wish to map to alternate nominal codes for any payroll items relating to directors, simply click 'Yes'. The default nominal ledger code mappings which specifically relate to director items in Kashflow will already be entered for the user - these can be edited by the user, if required. 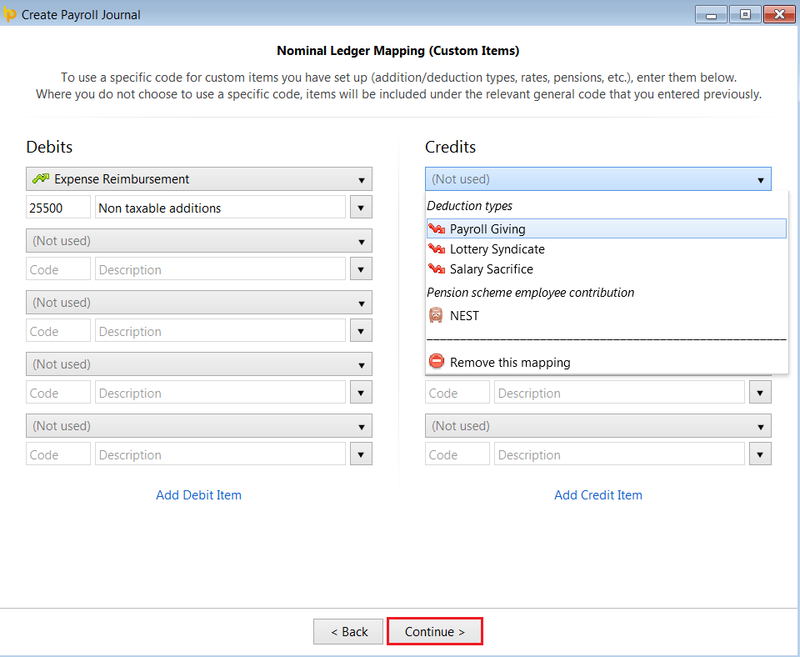 5) Nominal Ledger Mapping (Custom Items) - this screen allows the user to map custom pay items in BrightPay to other specific Kashflow nominal account codes of their choosing. Examples of custom items include addition/deduction types, rates, pensions, etc. Please note: where you do not choose to use a specific code, such pay items will be included under the relevant general code that has been entered previously. ii) enter a new nominal account code and description in the fields provided or select an existing nominal account from the drop down menu. c) Should you require additional fields, simply click 'Add Debit Item' or 'Add Credit Item' accordingly. d) When ready to proceed, click 'Continue'. Your journal will now be displayed on screen for review. Simply click the 'Back' button to make any amendments. b) Browse to the location where you would like to save your CSV file to, then click 'Save'. c) Press 'Print' to print or export a copy of your journal to PDF. d) To close the journal screen, simply click the cross at the top right of this screen. If you have made any changes to the journal, you will be asked if you wish to save your changes. Click 'Yes' or 'No' as required. 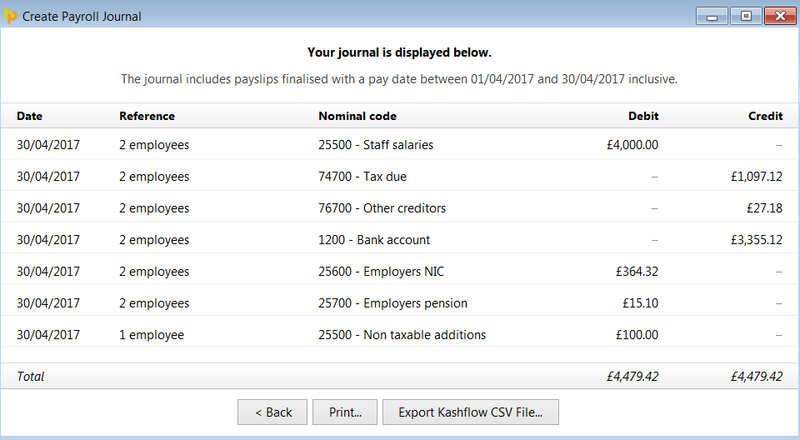 Your payroll journal is now ready for upload into your Kashflow accounting software.